You know the feeling you get when you want something and just can’t figure out what it is? I had it and hated it yesterday. A sense of longing filled me, and I couldn’t focus on anything except figuring out what I wanted. It took all day and most of the night for me to realize stagnancy had replaced my stillness. I graze when I’m empty, and that causes overfilling and under satisfaction. My exercise routine has been disrupted by the weather, and munching has caused me to slowly settle into a stagnant state. The trouble with settling is getting back into action. I needed rest this winter, but my body at rest has tended to stay at rest. I needed was an external force to get me going, and I knew One Who could do just that. I had an English teacher in high school who loved the old Latin proverb “Still waters run deep.” She said it frequently, and I often wondered if she was trying to get me to be quiet. I was a bit of a babbling brook in high school and still am in uncomfortable situations. I understand babbling, but stagnancy was beginning to stink. My heart longed for the deep movement of still waters, so I went to the Source of Living Water and asked for help. The difficult lesson in lethargy is that the longer I stay stagnant, the greater the force necessary to get me going. God made it clear in the wee hours this morning that the power that raised Christ from the grave is in my own heart. There is no greater power in existence, but God will not force His power upon me. I must come to Him. In the coming, I see how far I’ve wandered. I have to travel the road that took me off course in the first place. As I backtrack my way, I find the humility to go His way. Stillness is a constant movement that draws me closer to God, to myself, and to those around me. Rushing leads to babbling, and that takes me further downstream. Settling brings stagnancy, and that’s the worst state of all. I’m hoping the image of a stinky stagnant pond will keep me from wandering and help me move toward His still, deep waters because my heart will never be satisfied with anything less. I love this interpretation because it describes my own heart. God gave me drink from His quiet pool, let me catch my breath, and put me back on the right path this morning. I love it when He does that! The starting point is more important than the final destination because it defines my journey. If I’m stuck in the past, I’m never able to catch up to myself. If I keep a foot in the future, I hobble along at a pitiful pace. I do both and end up stuck or stalled as a result. If I start where I am by making peace with my present, the journey will be as God intends. I rehash my past, rehearse my future, and miss my present. Ice and snow have made for treacherous travel this week; when I finally did get out of the house, I found myself driving around with no destination in mind. It was wonderful to be moving after being sick and stuck indoors. Then, I sat in the sun and did nothing for a very long time. It was healing to soak in the sunshine and simply be. The best traveling is done when sitting still. It’s what allows my heart and soul to spiral upward, and that’s the destination I most desire. Culture says be productive, go places, take charge of your own future, and never look back unless you need an excuse for your troubles. In Psalm 46:10, God has a different view. It’s silly to think stillness is the best way to move. Love is also a lot of silliness when you think about it. In fact, all of God’s ways are silly to the world. His ideas may be foolishness to some, but I learned this week that foolishness is the greatest wisdom of all. I plan to love when it makes no sense and be still when I feel like running. God reminded me this week that stillness is the very best starting point for any journey. Life is a series of decisions that affect all those in my path. Every decision I make puts me either closer to God or further away from Him. It is impossible for me to make the right decisions without the help of the Holy Spirit. The old saying, “The road to hell is paved with good intentions” is wise indeed. Doing what I think is best isn’t the way to go. I have to listen to God and trust His Spirit when it comes to decisions. If I allow His Spirit to help me obey when I don’t understand, I will find joy and peace. Good intentions often lead to divisions as differences of opinion abound when it comes to what is right and best. Being still for an instant before speaking or acting allows time to pray and gives God space in which to work. I have always been a go-getter and a doer, and I can get a lot done in a little time when motivated. The practice of stillness in each moment allows me to do what God has in mind. I still get much done, but those tiny prayers leave me less frazzled. God has given me many opportunities to practice that stillness this week, and I can tell a big difference in what I’m doing and how I’m doing it. That’s a big step on the path to a praying life. One beautiful side effect of the new way of praying is the quality of my sleep. Racing thoughts are gone because they are all about plowing through the day without those still moments of prayer. The stillness before each decision takes care of them one at a time throughout the day, and the time of prayer before sleep finishes off any loose ends. I’m finding there aren’t very many left at the end of the day. I’m busier than ever, watching only a few minutes of TV each day, and more connected than ever. The images God gives are clearer without all the static, and His Word is alive in a new and beautiful way. Author GigiPosted on February 3, 2013 Categories God, Life, Love, PrayersTags decisions, divisions, joyful journey, praying, simplicity, stillnessLeave a comment on Decisions, Divisions…. The praying life is a life of stillness in the storm and warmth in the cold. It’s been a week of high winds, power outages, and snow, a perfect backdrop for lessons in stillness. Whether the imposed stillness of snow, holding Mylah while she sleeps, or laying beside Lillyann while she falls asleep, the stillness this week has been powerful. I am learning to be still and recognize God’s glory and appreciate the stillness that comes when I enter into His presence. Praying and stillness go hand-in-hand. Silence used to be the goal as I thought I had to find a quiet place to pray. Cookie, the German Pointer, and two very sweet little girls are teaching me that silence may be golden, but stillness is a state of heart that doesn’t depend upon silence or solitude. In fact, I’m learning that being in the midst of my sweet family brings greater peace than time alone in a reflection center designed for prayer. Time alone in solitude and silence is important, and I love to meditate on God’s Word; but I’m finding that stillness is a much deeper state that brings a sense of peace much like that beautiful blanket of snow. The world is so pure and beautiful right after the snow falls, and I love walking in freshly fallen snow. 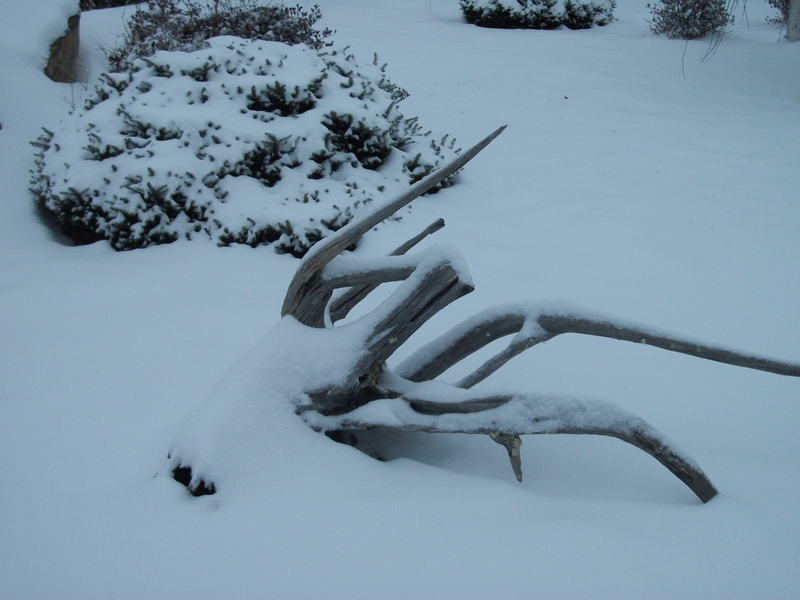 It amazes me how mundane objects and plants become magical when covered with a blanket of fresh snow. Stillness has the same effect. I don’t always have silence when I pray, but stillness doesn’t require silence. It comes when I stop and allow the everyday to become an expression of God’s glory.